I am constantly looking at genealogical websites, apps and tools. I recently found this terrific free app “Tree Connect,” powered by RecordSeek.com—a Real Time Collaboration company product. With just a few clicks, this app will add a hyperlink connecting any record or photograph I find anywhere on the Internet to the online family tree I keep on FamilySearch.org. It only works with FamilySearch, not with any other family tree website. Here’s how the Tree Connect app works. Go to RecordSeek.com’s website to get the free app. 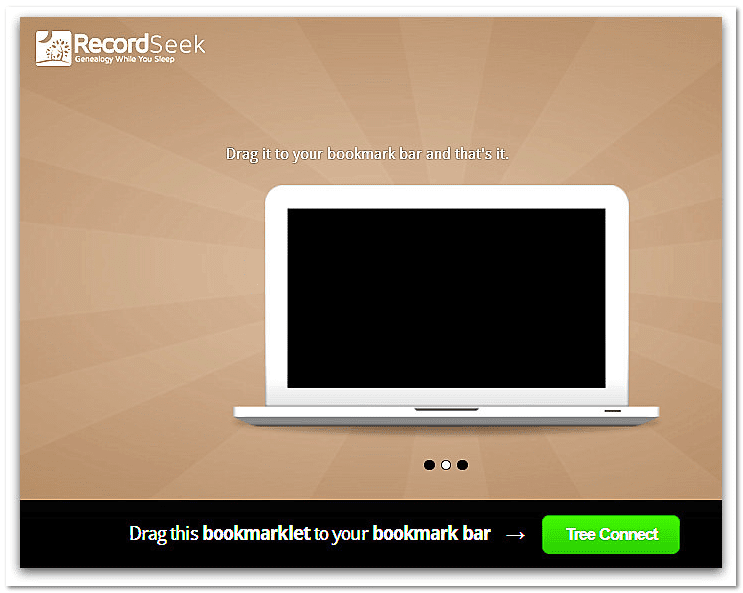 Find a photograph or record anywhere on the Internet that you want to hyperlink to your family tree. 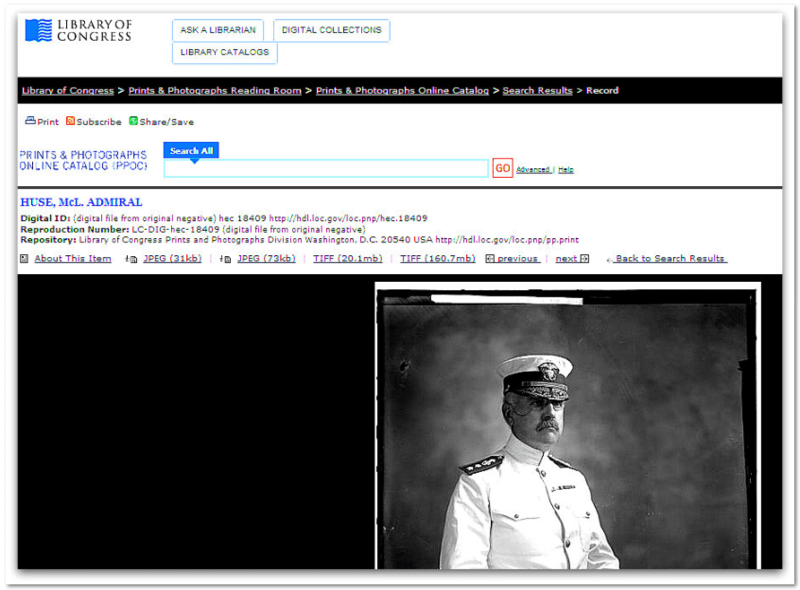 For example, here is a photo I found on the Library of Congress, Prints and Photographs Division website. This is my cousin Admiral Harry McLaren Pinckney Huse, and I’d like to add a link to this photo on my online family tree’s Harry McLaren Pinckney Huse page. When you see the family photo or document you want to link to your FamilySearch family tree, simply click the Tree Connect button on your browser’s bookmark bar. Tree Connect brings up a form for creating your source link. Edit each line of the metadata for accuracy and completeness. The Tree Connect app populates each line on this form with the metadata from the website that contains your target photograph. I want to change that to his full name and life dates. I’ll also add a brief descriptor (Photograph) and where I found it (Library of Congress). Harry McLaren Pinckney Huse (1858-1942). Photograph. Library of Congress. Once my editing is done, I click Save. 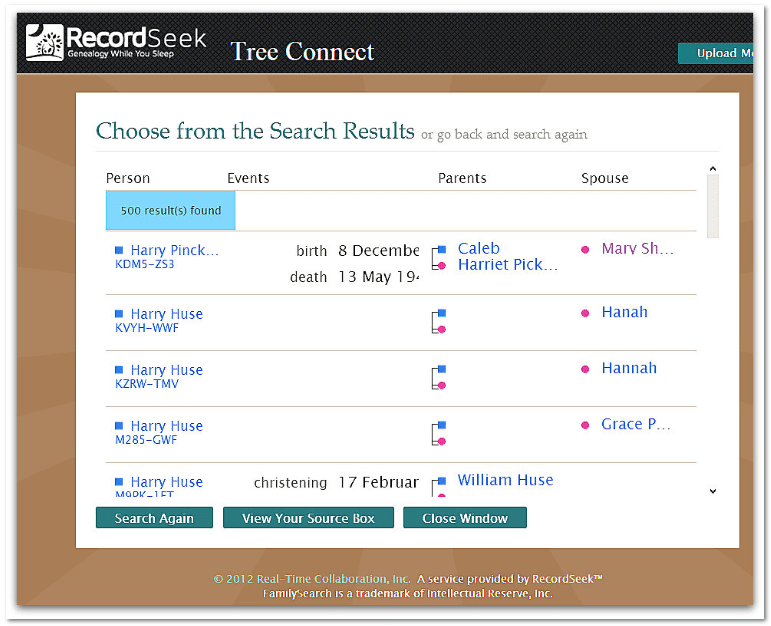 Using Tree Connect, find your ancestor on FamilySearch. 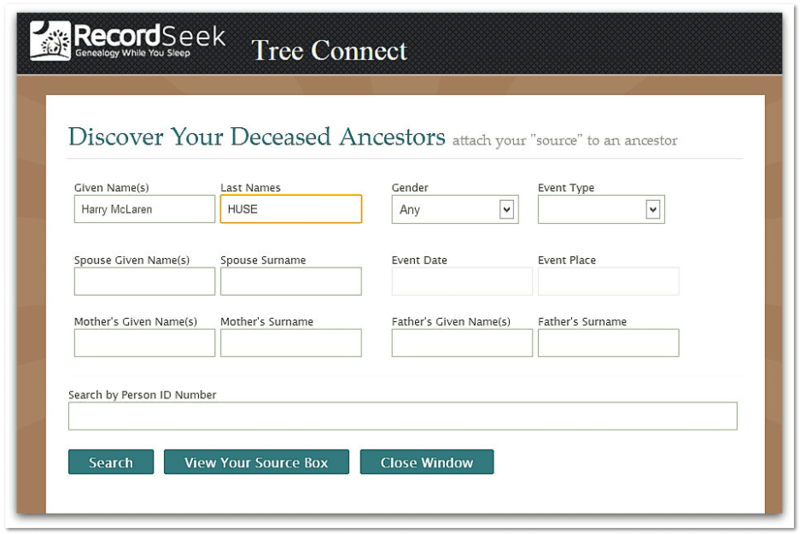 Fill in Tree Connect’s “Discover Your Deceased Ancestors” form to bring up your ancestor in your online family tree on FamilySearch.org. Select your target ancestor from the list of result hits. Click Attach and you’re done. With just a few clicks I have saved a link to the photograph I found on the Library of Congress website to my online family tree. I can click and see this photograph of my relative at any time. The Tree Connect app automatically includes a bibliographical citation and a link to the original source so I will always know where I found this family photograph. This handy tool lets me link to the photo without violating any copyright, since I am only linking to it—not downloading and adding a copy of the photograph to my online family tree. This is an excellent free application to help with your genealogy. Is there anything in the works to have this work with Ancestry.com? Not that we’ve heard, Linda. TreeConnect is great! 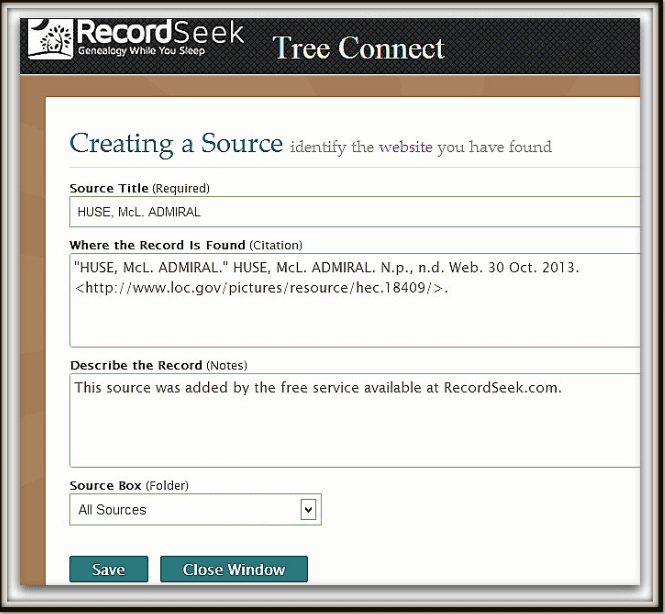 I have been using it for months now to connect sources to FamilySearch Trees. Great post!